It’s no secret that the world’s need for energy is increasing—but what many don't realize is that a promising potential energy source is being flushed down our toilets every day. Increasingly, this wastewater—as well as other organic waste from sources like gardens and kitchens—is being used to heat homes, provide electricity, and even power cars. This year’s World Water Day focuses on the problems and possibilities posed by wastewater. Wastewater is water contaminated with human, agricultural, or industrial wastes. While typically seen as a nuisance, the organic matter contained in wastewater from our sewage systems (commonly known as “sludge”) can become a valuable resource with sludge-to-energy systems. 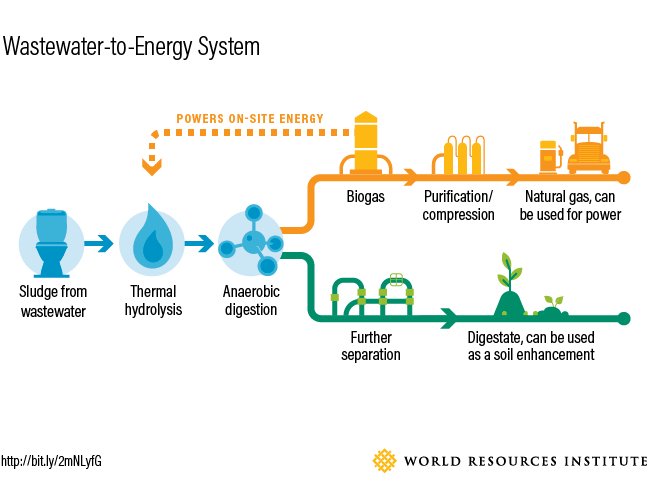 How Does Wastewater Become Energy? When organic waste decomposes in an oxygen-free environment—such as deep in a landfill —it releases methane gas. This methane can be captured and used to produce energy, instead of being released into the atmosphere. Sewage treatment systems begin treating wastewater by collecting the solid sludge. In a sludge-to-energy system, this sludge then undergoes a pretreatment process called thermal hydrolysis to maximize the amount of methane it can produce. Next, the treated waste enters an anaerobic digester, which finishes breaking it down. The resulting product is a methane-rich gas, or biogas, that can be used for on-site energy needs, or processed further and used in place of natural gas. In addition, the solid remnants of the waste create a nutrient-rich “digestate” that can be added to soil to boost plant growth. What Other Kinds of Waste Can Be Turned to Energy? Other organic wastes such as yard wastes, manure, and leftover food scraps and waste oil from restaurants are all excellent candidates for waste-to-energy systems. You can also combine these wastes to increase methane production. For example, combining sludge and kitchen waste provides a perfect recipe of organic matter and key bacteria needed for maximum methane production. What Are the Benefits of Using Wastewater for Energy? Energy production: The world needs more energy to support growing populations and expanding cities. Using waste for energy is a cheap, renewable and readily available form of energy for many cities. Since sewage treatment plants can use biogas generated from their own sludge to power their operations, it allows them to be energy self-sufficient. This ensures that a sewage plant’s primary function -- removing pollutants and disease-causing pathogens -- is not interrupted by surrounding power outages. Emissions reductions: Methane makes up 16 percent of global greenhouse gas emissions, and it’s extremely potent—about 30 times more powerful a greenhouse gas than carbon dioxide. Sludge-to-energy systems harness this methane for energy instead of letting it escape into the atmosphere, where it would fuel climate change. Although methane releases carbon dioxide when harnessed for energy, the net emissions are negligible if methane-rich biogas is being used in place of fossil fuels. Waste management: Many developing countries lack the infrastructure needed to properly manage solid waste and sludge. In these areas, this toxic, foul-smelling waste is often dumped directly onto land or nearby waters, where it can endanger public health. In China, for example, over 70 percent of municipal solid waste and sludge is landfilled or dumped—sometimes illegally. A sludge-to-energy approach provides a solution. Economic benefits: Sludge-to-energy systems reduce the need for more costly and polluting forms of power, such as fossil fuels. In addition, those who operate waste-to-energy operations can directly benefit financially from selling the gas and solid digestate. While sludge-to-energy systems are not yet commonplace, they’re spreading throughout the world. The United States, China, Brazil, Argentina and Norway are just a few examples of countries turning wastewater into power. Since waste management usually occurs on a local scale, it is up to municipalities in these countries to advocate for and adopt this technology. However, when waste is managed improperly, methane emissions make this local issue a problem of global importance. WRI has researched sludge-to-energy systems in Xiangyang, China. Our 2015 report found that one sludge-to-energy plant produced enough compressed natural gas to meet the daily energy requirements of 300 cars. The sale of the gas and digestate generates more than $1.5 million for the plant annually. Because of this research in Xiangyang, more Chinese cities have installed or are planning to install sludge-to-energy systems—including Beijing, Changsha, Hefei, Jinmen and Chengdu. The central government also selected 100 additional cities to pilot the use of waste-to-energy systems for kitchen wastes. WRI estimated that by 2020, waste-to-energy systems in China will have reduced emissions by 20 million tons of CO2e—an amount equivalent to the annual emissions of 4 million cars.